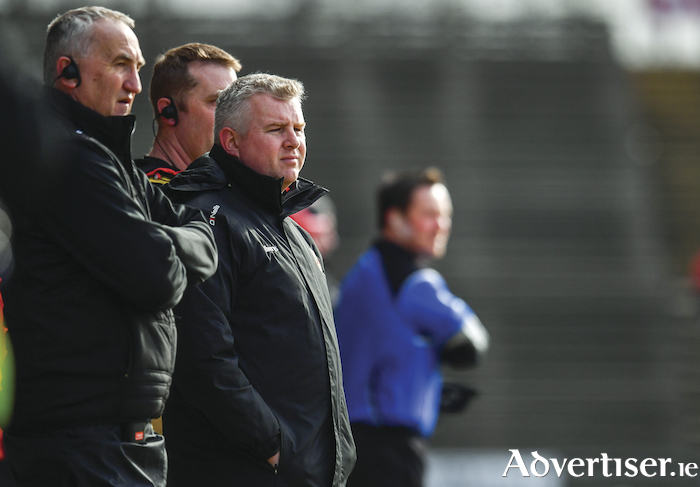 Looking for win: Mayo's management team will be looking to come up with a winning plan for Sunday. Photo: Sportsfile. It has come down to this, seventy minutes of football for Mayo to maintain their status as the Father of the House of division one football, or drop down to the second tier for the first time in over two decades. The permutations are simple enough, win or draw and Mayo will stay in the top eight in the league for next year, if they go down to Donegal, it is the trap door and division two for next Spring. Last weekend's defeat to Tyrone is one that will not live long in the memories for the right reasons, with the performance well off the high standards that the players, management and supporters expect. Mayo have not won any of the five games they have played in McHale Park this season, losing their three home league games along with going down to Galway in the FBD League and their only positive result being a draw with Leitrim on their home patch in round one of the FBD. Their one win on Mayo soil so far this year came in Ballina when they saw off Sligo in the final round of the FBD League. Along with that win over Sligo, Mayo have picked up only two more victories out of the ten games they have played so far this season, both on the road against Monaghan in round one of the league and against Kildare in round five. Another road win is something they will badly want, with their next outing against Galway in the Connacht Championship quarter-final on May 13. That meeting is not that far away now and after last weekend, it looks like Lee Keegan will not make that game having dislocated his shoulder, which will require an operation and Mayo will be hoping that Cillian O'Connor's hamstring injury will have healed up in time for that one, with him expected to be out of action for between four to six weeks at this stage. They will be without those two key men for this battle on Sunday - to add to the injury list that includes defenders Brendan Harrison and Donal Vaughan. The loss of both Keegan and O'Connor will force Stephen Rochford's to rejig his options for Sunday. Paddy Durcan came in for Keegan when he was forced out and it would be expected the Castlebar man will slot in for him again on Sunday. Having Durcan to drop into the team will not weaken the side that significantly. Replacing O'Connor will prove to be a far trickier task, Crossmolina's Conor Loftus was the man that Mayo looked to last weekend and he would be probable to get the nod again, with his free-taking ability something that Mayo will need in what should be a tough, nail biting encounter. With the game done as a contest last weekend, Rochford looked to be planning ahead for this Sunday's game when he withdrew key men Diarmuid O'Connor, Aidan O'Shea and Jason Doherty before the end of the game, making sure they could get as much rest ahead of this Sunday's vital encounter. Mayo supporters have been asked by Donegal to make sure they are in Ballybofey in good time on Sunday, with Donegal County Board saying that "the game will result in increased traffic in the Ballybofey/Stranorlar area. They would advise all supporters to arrive early to avoid traffic congestion and potential delays in entering the stadium. Gates will open at 12pm with tickets on sale at the grounds from 11.30am. There will be no parking inside the grounds for this event. "Entry to the stadium is by ticket only and no cash will be taken at the stiles. Advance ticket purchases can be made in your local SuperValu or Centra store priced at €12 for adults. On match day, tickets can be purchased from their ticket sales offices priced at €15 for adults, €12 for students/OAP ticket (with valid ID ). U16 go free on the day but they will require a ticket from the ticket office on the day."